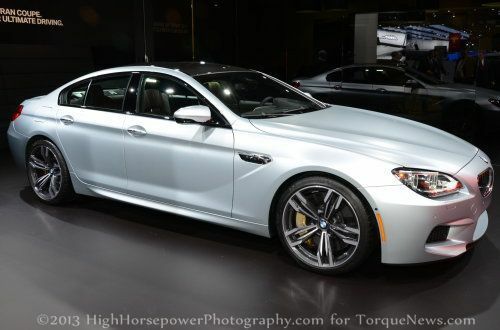 The 2013 North American International Auto Show was a big deal for the folks at BMW and the 2014 M6 Gran Coupe was one of their main attractions – roaring into Detroit’s Cobo Hall as one of the most powerful and quickest models in the company’s incredible lineup. The 2014 BMW M6 Gran Coupe – while packing 4 doors and departing from the convention coupe form that many Americans would expect from a car with that label – enters the company portfolio is one of the most impressive models in terms of its performance capacities. The M6 Gran Coupe is powered by the same twin turbocharged 4.4 liter V8 that is found under the hood of both the M6 coupe and the M5 sedan; packing 560 horsepower and 500lb-ft of torque. This is enough power to propel the M6 Gran Coupe from 0-60 miles per hour in just 4.1 seconds with the help of a 7-speed dual clutch automatic transmission on the way to an electronically limited top speed of 155 miles per hour. Compared to the BMW M5, the M6 Gran Coupe is a touch quick from 0-60 (the M5 with the dual clutch gets there in 4.2 seconds) and compared to the 2-door BMW M6 – the M6 Gran Coupe is just as quick to 60. In addition to that high performance M engine, the 2014 BMW M6 Gran Coupe features a sport tuned suspension system and a high performance braking setup that helps make the M6 Gran Coupe one of the best handling high performance 4-door models sold in the world while the unique “big coupe” design affords this version of the M6 more interior space and easier access to that space. Like all BMW models, that interior space is clad in panels that combine high end luxury while the M designation adds trim features that accentuate the sporty nature of the high performance M6. On the outside, the 2014 BMW M6 Gran Coupe doesn’t differ all that much from the 2013 BMW 640i or 650i Gran Coupe with the exception of the wheels and the revised front and rear fascias. Up front, the M6 Gran Coupe has a vastly more aggressive lower front fascia that includes a large central opening that keeps the twin turbocharged V8 nice and cool. That central grille opening is flanked by two smaller yet still quite large openings to help cool the high performance braking system. Around these outer openings the M6 Gran Coupe features some sculpting to the fascia that gives the nose a more aggressive look while a deep diving chin spoiler adds sporty style while also improving aerodynamics. Out back, the M6 Gran Coupe makes use of quad exhaust tips that are incorporated into the into deep indentations in the fascia while the center area of the lower fascia features an integrated splitter design that just screams high performance. Finally, the M6 version of the hip new Gran Coupe wears 20 inch wheels with a polished face and black pockets that are vastly more aggressive than the rollers found on the 640 and 650 models. For those wondering about the “coupe” portion of this BMW M6 Gran Coupe’s name, this model entered the 6 Series lineup that had previously been comprised strictly of 2-door models and while the M6 Gran Coupe packs 4 doors, it maintains that coupe form with a roofline that slopes quickly starting just behind the front doors. This allows the 6 Series Gran Coupe to offer the look of a touring coupe with a long wheelbase but like your average German touring coupe – the M6 Gran Coupe packs easier access to the back seat via the added rear doors. For a closer look at the 2014 BMW M6 Gran Coupe, click any of the thumbnails above on the right to view our gallery from the 2013 North American International Auto Show in Detroit.